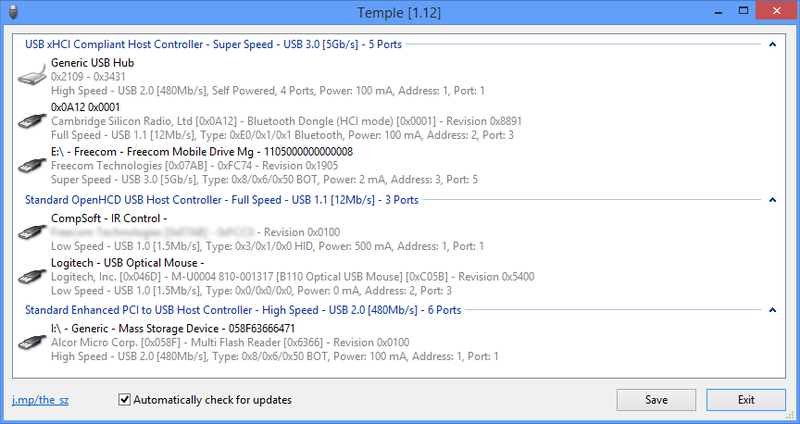 Temple is a tiny portable tool which gives you some low-level details on your PC's USB hubs and devices. Just for geeks? Not necessarily. If you're working on an unfamiliar PC, for instance, you might want to know whether it has any USB 3.0 connections. You can find this in Device Manager - probably - but it can take a few clicks and a little exploration, while Temple reveals all in a fraction of a second. Temple also displays some useful information about the various USB devices currently connected to your system: the manufacturer, product name, its maximum speed (whether it's a USB 2.0 or 3.0 device), power consumption, device type (does your external hard drive support BOT mode? ), power consumption, and device address. This report can be saved as a file, too, although only in XML for some reason (no TXT option). If you're trying to help a technically clueless long-distance friend with some USB issue then this is an easy way to find out more about their system.